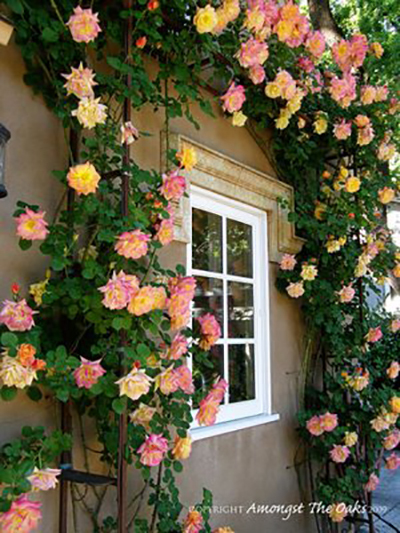 Early last summer I discovered the most gorgeous roses while driving through Georgetown. While I was writing about the color combination of pink and yellow-orange these beautiful blossoms came back to mind. They have a color scheme similar to the Veuve Cliquot Rose Ice Dress but with very clear yellows and oranges along with pink rather than just yellow-orange. Mother Nature put together a spectacular color scheme pink yellow orange – that is a perfect example for learning how to create your own color palette by copying from the nature. 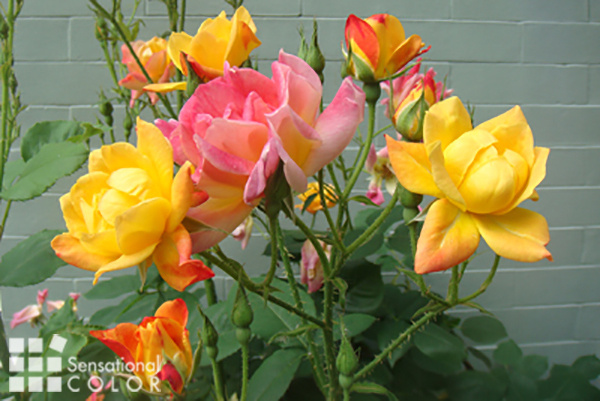 These roses are called Joseph’s Coat and I find the variety of colors on a single rose bush so appealing. They are a climbing rose but since the ones I photographed were in pots they didn’t show the full effect of how gorgeous these are when flowing over a trellis or fence. I did find this ‘story book’ shot of fully blooming Joseph’s Coat flowing around the window of Our Little English Cottage Amongst the Oaks. Doesn’t that look just perfect? 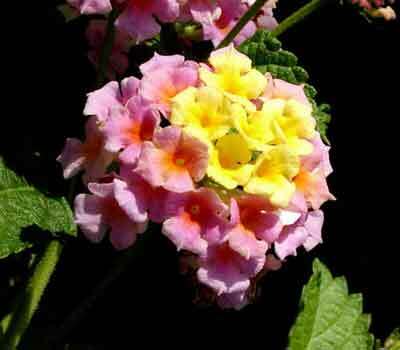 Mother Nature chose to put this same tri-color scheme in another of my favorite plants, Lantana. I have often enjoyed a mid-summer explosion of color when my wrought iron hanging baskets were overflowing with Lantana. When if come to cut flowers tulips are one of my favorites. 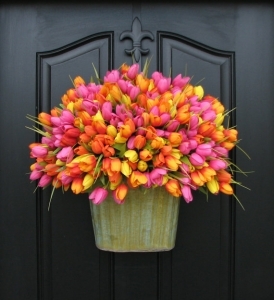 I especially like this bucket of tulips from etsy in the color scheme of pink, yellow, orange scheme. Keep in mind that even if a color scheme doesn’t show up all together on the same plant when you mix different colors of the same type of flower you can create a naturally harmonious scheme. And don’t feel that you have to match the colors exactly. Choosing a variety of tints, tones and shades of each hue will be much more interesting than matching everything to just three colors. 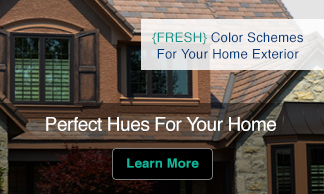 The colors shown above will give you an idea of the variety of colors you can use in this ‘three color’ scheme. 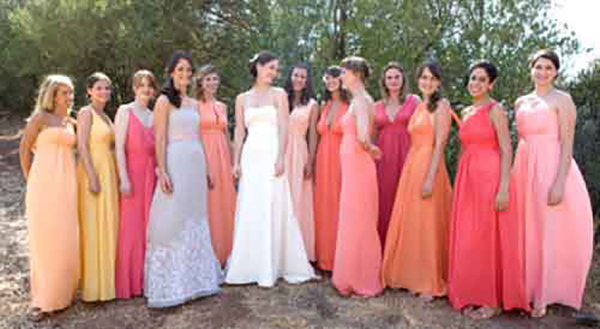 The bridesmaids dresses…how can you not love them? They were all designed by Kay Unger who is one of the more talented designers I’ve ever seen. Her dresses are effortlessly beautiful, each one making that particular girl look and feel ridiculously gorgeous. When developing your own color plan pick out a few elements that deserve this same treatment. 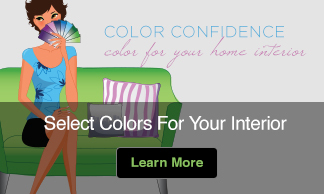 Think not only about your color scheme but also how you are going to apply it within your design. There should be at least a few elements that you want to have standout and look ‘ridiculously gorgeous’. Here are a few examples of pink, orange and yellow color schemes I think work well. 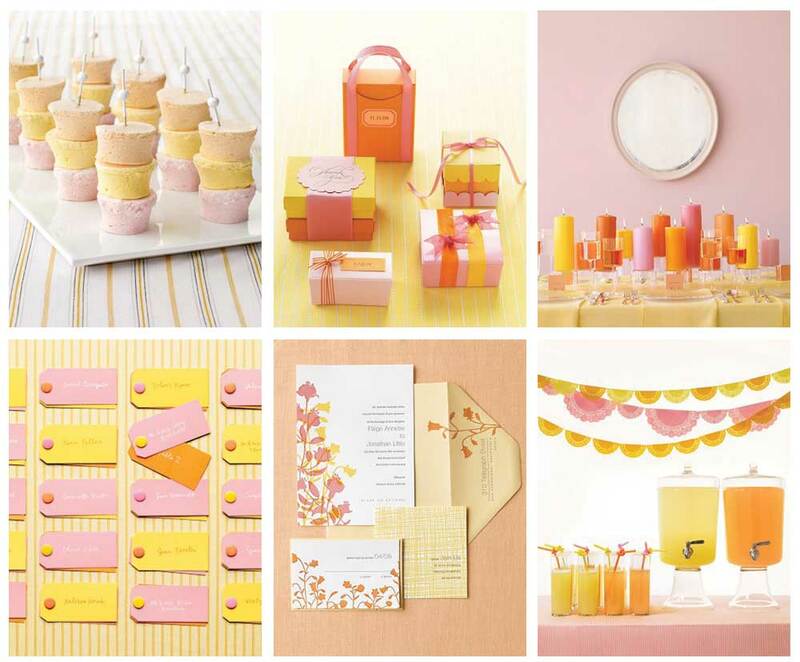 Martha Stewart suggests pink, yellow, and orange is a lovely option for a wedding color scheme. 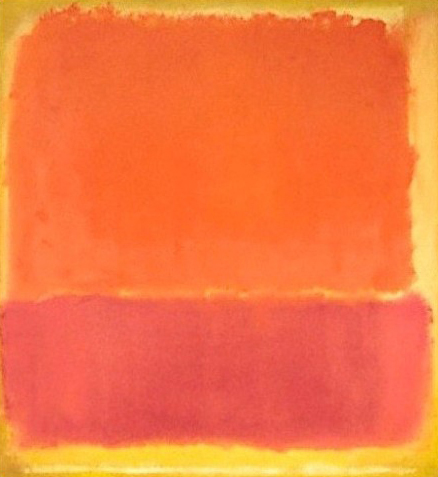 What ideas do you have for using the color combination of pink, yellow, orange? Such gorgeous photos. I never really put some of those colors together but I will now. Wish it were sunny with colorful flowers now. Hey…I live in Florida…it’s supposed to be that way…but instead it’s freezing:-) Have a wonderful pink Saturday! Beautiful flowers … and color scheme. Hi Kate! Happy Pink Saturday. Your post is breathtaking! Nothing gets my heart beating faster than color. Thank you for your gorgeous and informative article. Have a lovely day! ooohhh, what gorgeous colors! Thanks for sharing! Absolutely stunning photos of all your various color combination. The pink fits right in for today’s Pink Saturday. A truly beautiful showing. I loved all the flowers. Absolutely stunning photos. The color combination has me rethinking some ideas now. Hi Kate! Thank you so much for popping by to welcome me to Pink Saturday! I am crazy about color, too! Flowers, fabric, paint, shoes! I love it all. What a beautiful post! Rhose flowers growing up the wall..is perhaps one of the prettiest things ever. Thank you so much for showing us this beauty. Happy Pink Saturday..have a most wonderful day. I’m a day late and a dollar short☺ Was able to leave some messages for Pink Saturday yesterday and finishing up today. Over the holidays I was MIA from PS and really missed it but knew that I wouldn’t be able to visit many blogs. I’m back today and must say that it feels so good to visit familiar places – like coming home again.